See how water in many forms has fashioned and still shapes the scenery of Yosemite National Park. Learn how fire is an agent of change. Literary craft and lens-art present an interpretive overview of the significant features of Yosemite. Yosemite National Park is featured in the Ken Burns film "National Parks: America's Best Idea" as one of the top 10 National Parks you don't want to miss. 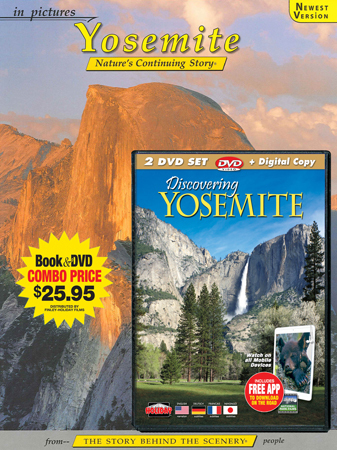 Filmed in high-definition, this is guaranteed to be the best, most complete Yosemite DVD available, exploring the park’s incredible scenery, seasons, wildlife, geology and more. BONUS DVD - This special edition includes a bonus DVD – Bears in Our National Parks – an in-depth look at the challenge of managing bears in Yosemite and America’s parklands. DVD EXTRAS - DVD extras explore Yosemite’s unique adventures, activities and history, including historic lodges, rock climbing, traditions and stunning time-lapse photography.